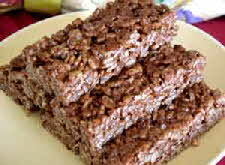 This is simply Rice Krispies Treats with added chocolate. It is nearly as simple as the original recipe. 1. In a large pan on the stovetop, melt the butter over low heat. Add the marshmallows. Stir until the mixture is hot, melted, and smooth. Add the chocolate chips and stir until smooth. 2. Add the rice cereal. Stir until the cereal is uniformly combined with the marshmallow mixture. 3. Remove the mixture to the buttered pan. Evenly distribute the mixture and press it down into the pan with buttered fingers, a piece of waxed paper, or a spatula. Let cool and cut into squares. Baker’s notes: The chocolate chips will melt in the hot marshmallow mixture. Depending on how well you stir the mixture, you will have either a uniformly chocolate mixture or a marbled effect. If you use a large enough pan, you can mix the treats right in the pan, not in a bowl. The hot pan makes it a little easier to stir the mixture together and there is less clean-up. Rice Krispies Treats are best eaten the same day.